Going on 35 years the world’s largest art community, located in Los Angeles, is once again opening its studios to the public. This is not your average Artwalk! This April at the Brewery, The Brewery Artwalk Association is pleased to feature the largest contingent of pioneering artists in the Los Angeles area. While some of our talented resident artists are painters, photographers. printmakers and sculptors, other resident artists have been experimenting with Immersive 3D environments, LED light sculpture, high tech and high class furniture design, contemporary fashion and environmental design, new media and digital art. The artists of the Brewery stretch the meaning of art in different directions, but are often on the leading edge of the Los Angeles art scene. Located northeast of downtown Los Angeles, off the 5 Freeway’s Main Street exit, sits 16 acres packed with creative energy, artistic dreams, and a little piece of historic LA. The Brewery Arts Complex was an operating brewery from 1897 through 1979. Its second life as an arts complex began in 1982 with the passing of the Artist-In- Residence code, a Los Angeles housing code that gave artists the right to rent live/work space in industrially zoned buildings. Housed in the industrial buildings of the complex is a uniquely vibrant and creative community. The artists (there are around 500) residing and working at The Brewery have opened their studio/homes to the public every year and most recently twice a year, for 33 years. 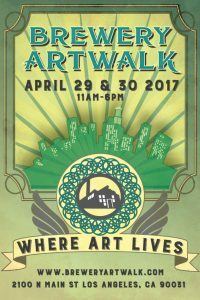 The Brewery Artwalk is the largest original Artwalk in the world. 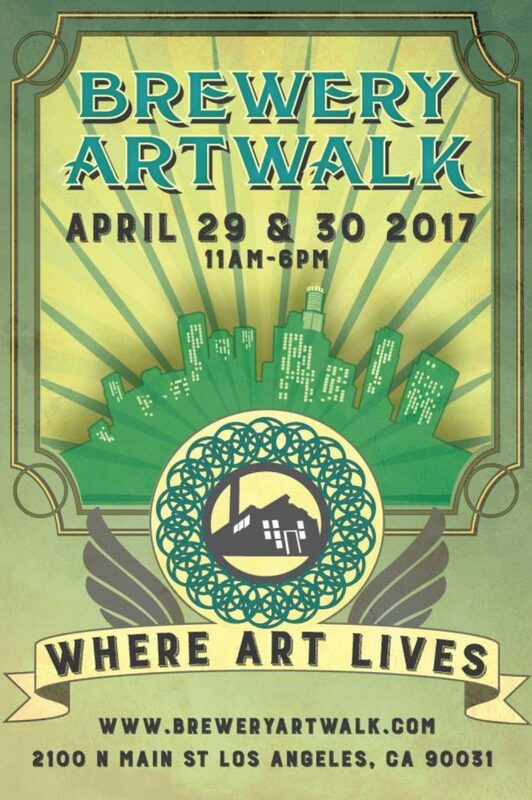 The Brewery Artwalk is FREE and open to the public! Whether you are an art collector, connoisseur, curator, want to buy unique fine art gifts, learn about the history of the community or discover how art, science and technology are linked; come enjoy an exciting free afternoon in the heart of LA’s art scene. There is free parking right across the street as well as a free shuttle from the Lincoln Heights/Cypress Park Gold Line metro station. This spring you can look forward to many new artists, food trucks, a beer garden hosted by our very own Barbara’s restaurant and a peaceful engaging environment. This is THE go-to art event of Los Angeles.